Double CD and DVD compilation focuses on the 'psychedelic' side of John Foxx's solo and collaborative work. Roll up for the metadelic mystery tour. Things often move very slowly in the musical and artistic world of John Foxx. the first mention of a "Metadelic" compilation harks back to 1999 announcement, in the Ultravox fanzine Extreme Voice, of future John Foxx releases for the coming century: "This album highlights John's long interest in making electronic psychedelia well as his more linear material". While the companion compilation Metatronic, also announced in 1999, eventually saw the light of day in 2010, we have had to wait a few more years to finally see Metadelic mysteriously materialize before our very eyes. ..and fast forward to the early eighties, when at last John Foxx has the capability and the hardware required to somehow pick up that thread and bring it into the now. Famously, Foxx shook off Metamatic’s 'total electronic' approach to music just as quickly as he had embraced it, post-Ultravox, from 1979 into 1980. After Metamatic it was time to 'chill out' and back home in London after an extended holiday in Italy Foxx is geared up with new music and new ideas. A new kind of man. And so to Metadelic. First the artifact: a hefty tome featuring 16 tracks on the first disc, supplemented by a second audio disc featuring a series of BBC session recordings plus a half a dozen or so of that peculiarly eighties invention, the 12" version. And if that's not enough there's also a DVD featuring promotional video performances of selected tracks pertinent to the 'metadelic' music. Tasteful artwork and sleevenotes by Martin Smith give us a feel of what is to come but it's the front cover that tells the greatest story: a close up portrait of a poetic dandy staring slightly right and into the middle distance; yes, it's John Foxx in dreamy, romantic mode, appearing like some Shelley or Byron searching to express the ennui of their age in poetry and art. 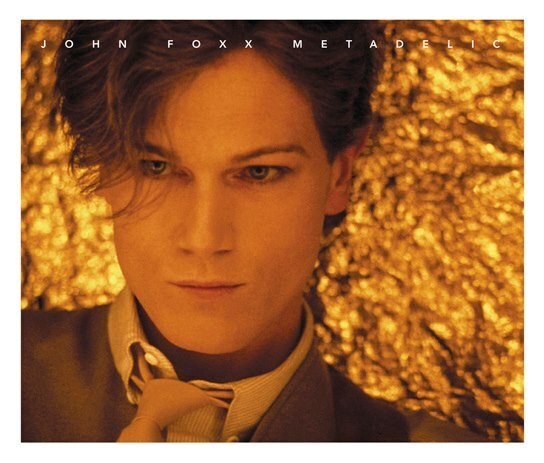 John Foxx as psychedelic romantic poet. Welcome to Metadelic. Opening track Swimmer II is an instrumental 12" B-side dusted down and now sent ahead of the rest to herald in the new metadelic era. Oddly (or perhaps fittingly) we're taken back to Foxx's Systems of Romance sound with his former band Ultravox. The screeching synth that cuts in about half way through and the almost-motorik drums could easily have been played by former bandmates Billy Currie and Warren Can respectively. A Systems of Romance out-take? We can but speculate. Second track Miles Away stands almost as a manifesto of Foxx's breakaway from the cold years of Metamatic: "there's a new man at the edge of me..making new plans for the rest of me" asserts our poet, sounding as if he's borrowed Gary Numan's synths (and drummer) to help him out. Europe After the Rain with its bouncy bass synth and acoustic guitar skillfully evokes the artist's time spent in warmer continental climes and as 'comeback' single at the tail-end of summer '81 it's still baffling as to why Foxx didn't go higher in the charts in those days with such a danceable, hummable and indeed lovable tune. (cf. the similar dreamy romanticism of OMD's Souvenir, which ironically appeared on the same night on TOTP and reached number 3). But no matter, with Europe Foxx took us into his new album The Garden, further represented here by the rather bizarre Dancing Like A Gun (with an even more bizarre promo-video featured on the DVD). Was "Nothing I can see looks like an exit, so I'm turning you into a door" an attempt at 80s psychedelic lyricism? Another miss (as opposed to hit) single. But it's with 1982's Endlessly that our poet really starts to hit the psychedelic target - its sitar, looping drum and Lennonesque vocal making it the best song George and John (and at a pinch Paul) never wrote, circa 1967. It was a brave stab at a psychedelic/Beatles revival but despite the twentieth anniversary of the Fab Four in that year (their 20 Greatest Hits album and The Compleat (sic.) Beatles documentary were both re-released in the same year) Endlessly sunk without a trace. But let's try again. A re-recorded and remixed version (featured here in two remixed extended versions on CD2) surfaced on 83's The Golden Section album further represented by the superb Twilight's Last Dreaming (check out the session version for some excellent live whistling) and again through Sitting at the Edge of the World, but both showing Foxx at his Beatley best with the distinctly Lennonesque lyrics and more shades of Strawberry Fields in the latter. But with the oddly titled Annexe Foxx abandons the kaftan, doffs a passing parka and hops on his moped to evoke the sound of a late sixties pop group which never really was. It is perhaps only the reverberating (?) drum sound on Annexe which deters us from thinking it was recorded in the summer of 1968. More of The Golden Section on Ghosts On Water, which sees Foxx in one of his most metadelic of moments. (A final stab at the mainstream came with In Mysterious Ways, the 1985 album represented here by a handful of session recordings, a couple of extended versions and an attempt by Foxx at bringing his visual arts into the video format). It's hard to believe that some twelve years separate the closing notes of "Ghosts on Water" and the opening of "An Ocean We Can Breathe" yet the transition in this largely chronological Metadelic mystery journey is apparently seamless. Foxx's comeback album "Shifting City", conceived and created with new play-pal Louis Gordon, brings together psychedelia and electronics like never before. Foxx combines his Metamatic electro-craftsmanship with that long lost "Tomorrow Never Knows" track as is evident on the trippy, looping "An Ocean We Can Breathe" and likewise on "Through My Sleeping", a sturdy couple making way for the stomping, clomping "Shifting City", bringing Lennon and McCartney into a futurist parallel universe where all you need is synth. Our metadelia mode continues with more Foxx/Gordon aquatic adventures in Underwater from 2006's Sideways album. Rather surprisingly Foxx's one-off Never Been Here Before (2008) recorded with Finnish musician Juri Hulkonen is also included here. Metadelic is brought bang up to date with a sample of Foxx’s work with new found collaborator, modular synth supremo Benge. Hail, therefore, John Foxx And The Maths represented here by Invisible Ray , perhaps more representative of Foxx’s quasi-religious vocal style rather than psychedelia, but the jolly motorik (there it is again) driven beat of Vapour Trails, brings our metadelic journey to an end, at least for the time being. Metadelic’s second disc proffers alternative versions to Foxx’s 1980s metadelic output, both in the form of specially recorded session versions and extended remixes, most of which see their first official digital release. But other than just a collector’s compendium the BBC session recordings give us an idea of Foxx as ‘live’ musician. These sessions are bonafide live recordings in which we are given ample scope to appreciate the poet Foxx’s vocal as well as instrumental talents. The sound of the Simmons drums may jar somewhat but they put the music very much in the perspective of being far superior and indeed much underrated compared to many contemporaries. The version of Ultravox-period Hiroshima Mon Amour included here is a fitting link between the then and now, but the strength of the song itself allows it to stand up to any amount of whistling or doof-doof drumming. Much of the video material is also issued officially for the first time on the Metadelic DVD, although sadly the Miles Away clip has been drastically re-purposed with a rather non-cohesive assortment of 1950s car and travel themed film footage. Thankfully the aptly surreal video for Dancing Like a Gun and the dream-like Endlessly film are intact, although it’s the badly lip-synched TOTP performance for Europe After the Rain, beautifully restored here, which best represents our metadelic poet Foxx. Flanked by assorted pals, our new romantic sways to the Metadelic beat complete with dandy clothing and acoustic guitar strapped casually over the shoulder, “ .. time to make our way through the fountains, squares and the colonnades….“.